Round bowl freestanding white marble bathtub design. This has a chiseled exterior and a smooth interior. The chiseled bathtub exterior gives more of a natural stone look. We have photos of this same bowl design carved from limestone and sandstone. Granite is frequently used for a rough natural stone bath design. Custom sizing and designs are available. Please call for more information on our customized options. 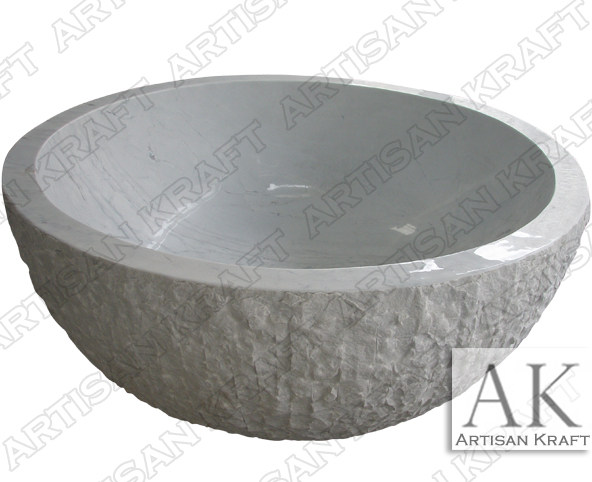 This is one of the many round stone bathtubs that are bowl style offered by Artisan Kraft.